Reigning Division III men’s champions Denison University and perennial powerhouse Kenyon met for one of the biggest DIII matchups of the season Saturday, within Denison putting on a commanding performance. A number of standout swims from Kenyon kept the women’s meet close. Kenyon senior Hannah Orbach-Mandel, who already owns the fastest time in the nation this year, won the 200 free in 1:53.51. Teammate Kendall Vanderhoof took second in 1:53.80, the fourth-fastest time in the country; nobody else in the field was under 1:57. Vanderhoof would later take second in the 500 and Orbach-Mandel third, going 5:10.47 and 5:10.68, respectively. Denison’s Hannah Rusinko won the race in 5:08.46. Denison’s Natalie Zaravella won the 1000 free, going 10:33.47 – the No. 4 time in the country this season. Behind her was teammate Grace Kacmarek in 10:37.05 (Kacmarek’s 10:33.46 from last weekend is the No. 3 time this season). Reigning DIII champion Crile Hart, of Kenyon, won the 100 back in 55.83 – no one else was under :58. She later won the 200 back in 2:02.26, over six second ahead of the field, despite being 1.5 seconds slower than her nation-leading season-best of 2:00.66. Hart also posted the nation-leading 200 IM, winning 2:02.57; in second was Denison’s KT Kustritz was second in 2:03.90 (No. 2 in the nation). Kustritz, also a returning DIII champ, won the 100 breast in 1:02.55; her season-best of 1:01.44 currently leads the nation. Teammate Kate Mesaros was second in 1:03.99 – no one else broke 1:06. Kustritz, whose 2:17.41 from a week ago leads the country, also won the 200 breast in 2:18.43. Maddie Hopkins (Denison), who owns the nation No. 1 time in the 100 fly at 56.61, went 56.80 to win Saturday. Teammates Zoe Whelan and Kate Mesaros went 2-3 in 57.60 and 58.18, respectively. Kenyon’s Abby Wilson dropped the fastest 100 free in the nation by over a second, winning in 51.75. Teammate Celina German was second in 53.75 and Denison’s Michaela Morrison third in 53.92. Wilson won the 50 in 23.95. Kenyon picked up a win in the 200 free relay to close out the day. The team of Caylee Hamilton, Emmie Mirus, Hannah Orbach-Mandel, and Abby Wilson split 24.67/24.43/24.06/23.15 to win in 1:36.31 – good for the fastest relay in the country this season. Denison’s 1:36.63 is the No. 2 time this year. The home men’s team had the meet under control from the get-go. 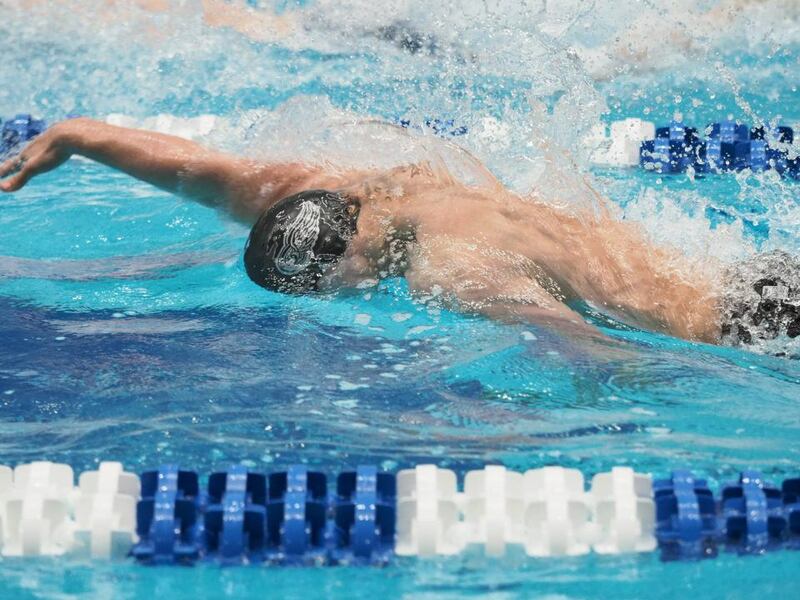 Denison’s Matthew Hedman posted the top time in the nation this year in the 1000 free, winning in 9:24.20. He was 15 seconds ahead of second–place teammate Dayen Wilson, who was (9:39.52). Hedman, whose 4:31.58 is the No. 1 time in the nation, went 4:35.04 to win the 500 – no one else in Division III has been under 4:38 this year. In the 200 fly, Denison’s Mitch Williams posted the second-fastest time in the country, winning in 1:51.75. Teammate Noah Houskeeper was 1:52.14 for second place. Tiernan Foster-Smith led the Denison sweep of the 100 breast, going 57.11. Kenny Fox was second in 58.71 and Sam O’Malley third in 59.29. Foster-Smith later took third in the 200 breast (2:11.71), with teammate Ryan Stevenson winning in 2:09.10 and Kenyon’s Patrick Olmstead touching second in 2:10.86. Denison also went 1-2 in the 50 free, with Kymani Senior taking first in 21.27 and Matt McHugh second in 21.37. Kenyon went 2-3-4 beyond Denison’s Drake Horton (46.67) in the 100 free. Tommy Weiss took second in 47.08, Robert Williams third in 47.22, and Joseph Black fourth in 47.26. Denison’s Bebe Wang posted the No. 2 time in the nation in the 200 back, going 1:50.30. Teammate Samuel Jo was second in 1:52.61, and Kenyon’s Grant Thompson was third in 1:53.00. Wang also won the 200 IM in 1:54.26 (another nation No. 2 swim), followed by Thompson in 1:54.56. Wang was second in the 100 back with a 51.83 behind Kenyon’s Nick Tong in 51.66. Tong won the 100 fly in 49.98, the No. 2 time in the nation. Behind him was Denison’s Colin Macmillan in 50.77 and Kenny Fox in 50.87. Kenyon’s team of Cole McMahon-Gioeli, Marcus Hong, Tommy Weiss, and Weston Carpenter (21.46/20.84/20.88/20.52) won the 200 free relay in 1:23.70. Denison was second in 1:24.04. Hey, “Swimmer,” I’ve noticed you trolling around these Kenyon articles and leaving either the exact same comment or just spitting out pure hatred. Kenyon is a great team, and their men and women are currently number 1 on the championship poll for D3. You have no ground to your negativity that you continue to espouse in these comments. So, I encourage you to maybe calm it down a little, yeah?